Looking for that perfect plush companion for your little one? Look no further than Lou Lou's Corner and our amazing selection of Stuffed Animals & Dolls. Choose from a variety of super soft Jellycat Stuffed Animals, in just about every animal and style you can imagine. 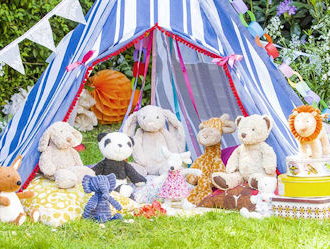 Or browse our collection of adorable lovey blankets from Bunnies by the Bay, Barefoot Dreams and Aden + Anais. Plus plush baby rattles and chimes, dolls and so much more! Just pick a category below and see where it takes you!